Engine mapping is charged at £100 per hour. - omex, emerald, mbe, kms, motec, life, aem, vems and many more systems catered for - note: MS based systems are NOT supported by us. Carburettor Tuning available at £100 per hour. Available for all types of carburettor including bike carbs and multiple carb set ups. Weber and Holley jets carried in stock, bespoke needles made for SU carbs. Includes RPM, Boost*, BHP, Torque and AFR logging. consists of 3x runs, complete with power graph. You are welcome to film your power run. Club Dyno days are also available for booking. Maximum 25 cars, Free Tea, Coffee and BBQ are also on offer. Full printouts provided. Dyno days £40 per car. Advanced booking required. 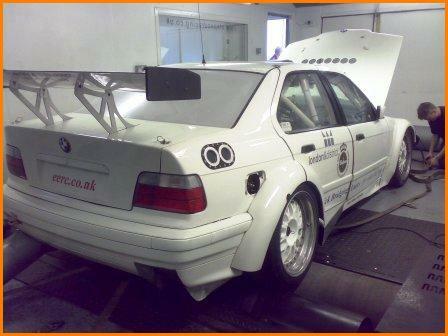 Dyno Cell Hire is also available to Race Teams & Professional Engine Tuners upon request. Morning, afternoon and evening* sessions available. includes dyno operator. contactus for more info. Evening Hire £100 per hour (6pm til late) . Bookings/Deposits: To book please call or email us. Typical 1-2 week advance during peak periods. Due to high volumes of "no shows" we are now forced to take deposits or payment up front. Mid week power runs must be paid in full at time of booking and are non returnable. Regular bookings or dyno hire are subject to non returnable deposit of £100 at time of booking. 1000BHP 2wd Clayton Chassis Dyno. Inertia and Full Load Dyno Testing. TAT PRO data acquasition software. Fully Soundproofed Purpose Built Dyno Cell. High Output Cooling, Ventilation and Extraction fans. Multipoint monitoring AFR, Boost, EGT, IAT & more. Weather Station Controlled Test Environment. Dyno Testing Spectating/Waiting Room with FREE WiFi. The Atspeed Essex workshop facility is host to a spacious 32x14ft sound proof dyno cell, featuring an external spectating room for safe, comfortable viewing. The dyno cell is very well lit, and clinically clean. 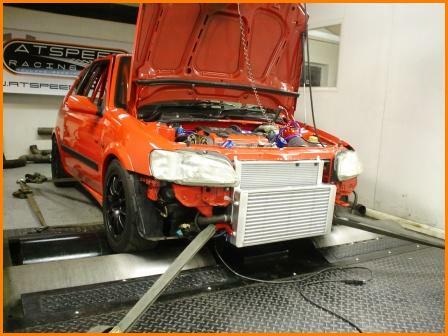 The dyno cell has numerous cooling and extraction fans, and is capable of changing the air in the dyno bay 4 times a minute, resulting in a more accurate, safer test environment for you and your car. The main cooling fan is capable of keeping a well designed cooling system on a 600+ BHP car cool for many hours of continuous dyno testing. All temperatures are constantly monitored at all times. Inside the Dyno Cell lies our 1000BHP Clayton 2WD chassis dynomometer, capable of inertia (2000bhp) and FULL LOAD testing upto 1000BHP, whilst handling speeds of up to 200mph. This rolling road has one of the highest power capacities known in the UK, making us popular with some of the UKs leading tuners. 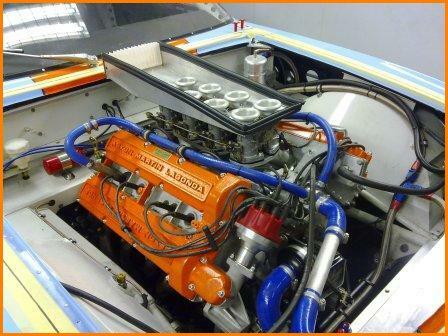 The Clayton Dyno is embedded into the workshop floor, its low profile allows even the lowest of todays modern race cars to be tested without the common ride height issues, including formula type race cars, and group C etc. Atspeed use TAT software. This allows pretty much limitless channels to be monitored, including: AFR, Boost, Torque, BHP, Exhaust Gas Temperatures and many MANY more! Dyno print outs are available, and graphs can be overlaid for comparison. These are just a few of TAT features, the possibilities with this software are almost endless. Our dyno and TAT software gives REAL and consistent figures, we do not sell any "performance enchancing" products, i.e. exhausts and shiny air filters - in short, our dyno is a piece of test equipment NOT a sales tool. This is why companies and professionals such as AER, Mountune, Xpower, Joe Stevens, Terry Dolphin, Keith Pointing, to name just a few, have all used our facilities for in chassis testing/calibration. Many people are put off by the horror stories of the past regarding rolling roads and the stress and strain on engines as the dyno operator tried ever further to make the big dial on the wall read higher. With the latest breed of computer technology and rolling roads, this is all a thing of the past. A typical dyno power run now lasts around 8-10 seconds at full throttle. During that short time we have live recorded all the required data we need, air fuel ratio, bhp, torque, rpm, manifold pressures, temperatures etc. Firstly the car is reversed into the Atspeed workshop, here a quick safety check of the car is carried out, such as wheel/tyre condition, engine fluid leaks/levels, driveshaft CV boots, condition of coolant hoses etc. All basic stuff, but the vehicle must meet these simple safety checks before any dyno testing can be carried out. A stainless steel lambda bung can be welded into the exhaust system at the collector, to allow the wideband lambda probe to monitor the exhaust gases, two probes are fitted for V engines (one for each bank), this is recommended for accurate Air Fuel Ratio (AFR) readings when setting up light throttle openings where slow exhaust gas speed is achieved. So vital for mapping or carburettor tuning. However for a simple power run, a lambda probe can be inserted up the tailpipe for accurate full throttle AFR readings. The car is then placed onto the rolling road, and securely strapped down in place. Vehicle information is then entered into the TAT Pro software, such as engine size, tyre size and any specific vehicle information. Other additional sensors for boost pressures, oil/water/air temperatures, exhaust gas temperatures (EGT) may also be added. The vehicle is then driven slowly to synchronise engine RPM with roller speed, for accurate RPM readings. Testing is usually carried out in 3rd/4th gear. We are now ready for testing. A baseline run is then recorded usually from 2500-3000rpm up to maximum power. Of course carefully monitoring engine conditions and behaviour. The recordings are analysed and displayed as a graph. Armed with this information we can repeat tests over and over again to within+/- 0.1% accuracy, graphs can be overlaid and prove any gains we have made. There is no guesswork with this technology.